This hand carved candle holder is made from Himalayan salt. 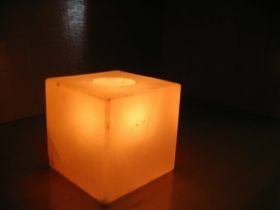 Place a tea light into the crystal candle holder and enjoy its warm glow while it emits negative ions into the air. Negative ions clean the air. Millions of years ago, beneath the Himalayan Mountains, these pure pink crystals were formed. Protected from modern pollutants, Himalayan salt is often referred to as the purest salt of the earth. They exude ancient healing negative ions that pull toxins from the air, and rejuvenate the spirit. Beautiful, powerful, pure and natural can be used to define our salt products. Carved by artisans to hold a single tea-light candle, the majesty of this piece cannot be denied. The negative ions emitted cleanse the air and create an atmosphere that reduces stress. Bring a sense of well being into your own home.